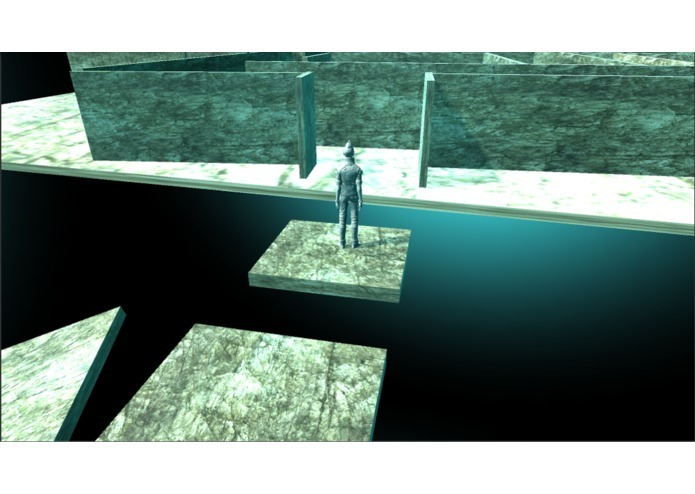 Screenshot of player before entering the maze portion of the demo. We were inspired to build a 3 dimensional world that you could see from any angle to plot your courses of action thoroughly. Also, we wanted to build a game that did not contain violence, gore, or rude language that could be both appealing to children yet also a challenge for adults to master. The game is built in a 3D space in the Unity engine. It allows a player to move through the 3D environment that we mapped out (some platforming and a maze) and to use a 3 dimensional camera that helps players navigate obstacles easier and plan strategic maneuvers for the challenges ahead. We first took a standard 3D space asset from the Unity engine as our basis for construction. Once we took the basic physics that we needed from that, we coded in an out of bounds area, a respawn system, optimized controller input, and created a clearly visible end goal. The end goal is the only wall that you can pass through, and is such colored as a metallic green color. Originally, we wanted to create the game in a VR environment, with the camera being controlled by an Oculus Rift. However, the Oculus did not work with any of the computers we had at our disposal, so we made the game into a regular 3D platformer. We also came across challenges when we initially tried to create the physics for the game, most notably Collision Detection between the player and the floor. We are proud of the sheer amount of C Sharp code that we produced for this product, considering that no one had experience with C Sharp beforehand. We are also proud of being able to get our game to function properly with minimal bugs (even though they barely affect gameplay and overall enjoyability, it is still worth noting that our game is not 100% perfect in terms of the code structure) and the ability to create our own Skybox and platform textures. We learned the ins and outs of the C Sharp programming language, one that my team and I had no prior experience with and we also learned of how to code basic physics in the Unity 3D engine. Worked on conceptual ideas and texture mapping, along with research into the technology of how the Unity engine handles certain environmental conditions and how certain objects interact in the engine. Worked more on the coding aspect of the project like to methods and functions.